Vulnerable women are disappearing and Detective Inspector Helen Grace suspects another serial killer. If so, it will be her third, and her success is causing tensions amongst her team in Southampton. 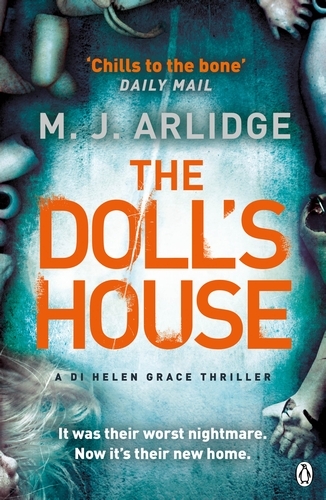 In The Doll’s House, MJ Arlidge tells a taut story about girls, captured and confined in dark, dismal places. In the first chapter, a woman wakes in a dark cellar, and a young family on a day trip to the beach finds a body buried in the sand. This ticks so many boxes for me: the real Southampton setting, the believable Helen Grace, the police politics, Helen’s continuing relationship with fellow officer Charlie. This is a convincing portrayal of Ruby, a troubled young woman with family issues, who wants to put things right. She was adopted and had a happy childhood, but a reunion with her birth mother sours her life and she disappears. Her mother receives only brief texts and tweets, saying she is trying to sort out her life. This is a clever killer who keeps his victims alive beyond their grave.